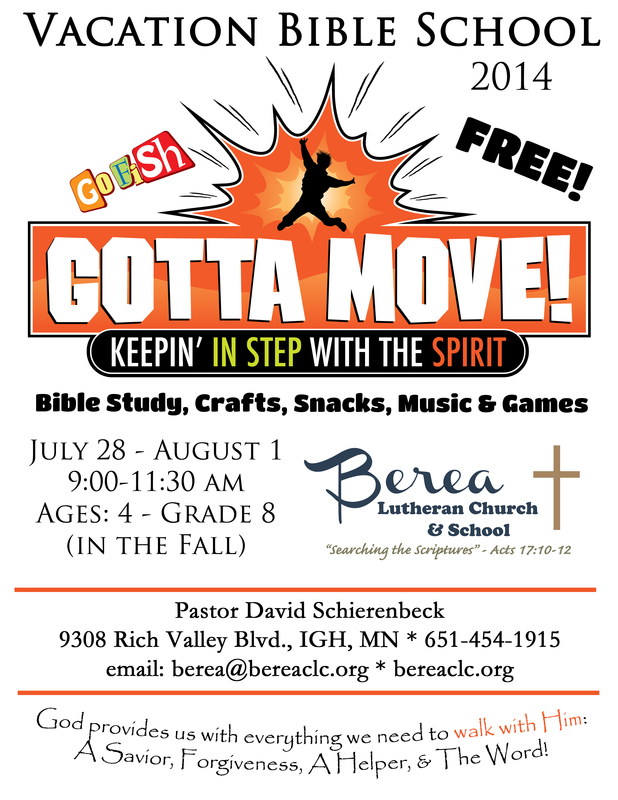 Join in the fun with Berea Lutheran Church’s 2014 VBS (Vacation Bible School)! This year we will be learning to Keep in Step with the Spirit through daily Bible study, music, crafts and games! 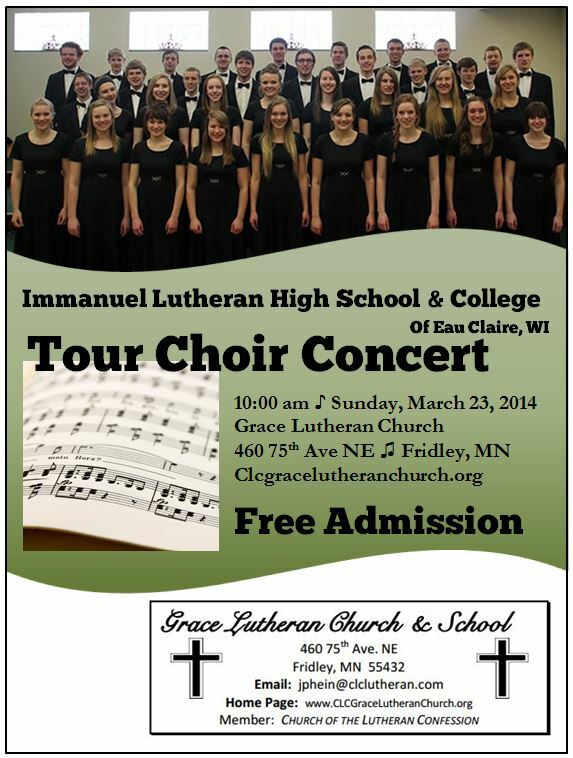 Immanuel Lutheran High School and College of Eau Claire, WI is coming to the Twin Cities to perform a concert. Grace of Fridley is very blessed to be able to host one of the concerts this year. Come and be spiritually uplifted by the sacred music the choir will share! This entry was posted in Events and tagged Concert, Tour Choir. Come thank and praise our Lord for the many blessings He has given to us at our special Thanksgiving worship services. These services will be offered at two different locations and times for your convenience. 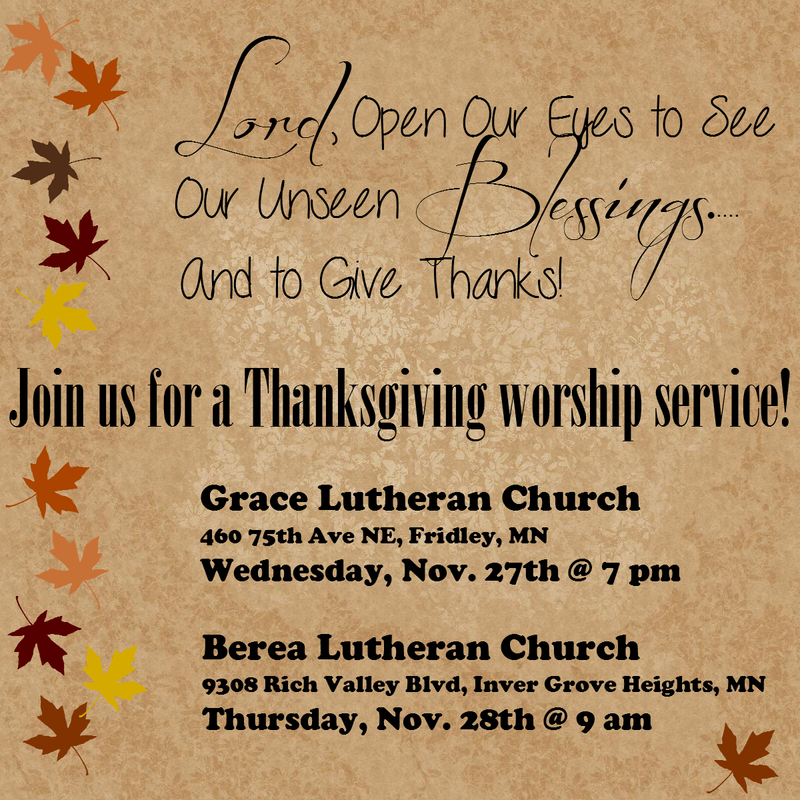 Grace Lutheran Church of Fridley will hold Thanksgiving worship Wednesday, November 27th at 7:00 p.m. and Berea Lutheran Church of Inver Grove Heights will hold Thanksgiving worship Thursday, November 28th, at 9:00 a.m. May our heart’s response for all the wonderful things the Lord has done be to come together and hear His Word! This entry was posted in Events and tagged Thanksgiving. The Bible: God’s Divine Word or Human Speculation? On Sunday, October 13, Immanuel Lutheran Seminary Professors Steven Sippert and John Ude presented a Bible Seminar on “God’s Divine Word or Human Speculation?”. They spoke on issues concerning the widespread rejection of the verbal inspiration and divine authority of Holy Scripture. The seminar was co-sponsored by Berea Lutheran Church of Inver Grove Heights, Grace Lutheran Church of Fridley, and Church of the Lutheran Confession of Eden Prairie. Please join us for a Bible Seminar on God’s Divine Word or Human Speculation?. Come to learn and discuss the issues concerning the widespread rejection of the verbal inspiration and divine authority of Holy Scripture. Date: Sunday, October 13, from 3:30 – 5:30 p.m. ATTENTION: If you are coming from the east on 494! 494 is CLOSED from 24th Ave. to 35W this weekend. 24th Ave is the exit for the Mall of America/Radisson and IS open, but the backup begins several miles to the east before that point. It is recommended that you leave early for the seminar or find a route that could take you up from the south (since Radisson is on the south side of the mall). If you are travelling on 494, stay in the right lane to exit at 24th Ave. 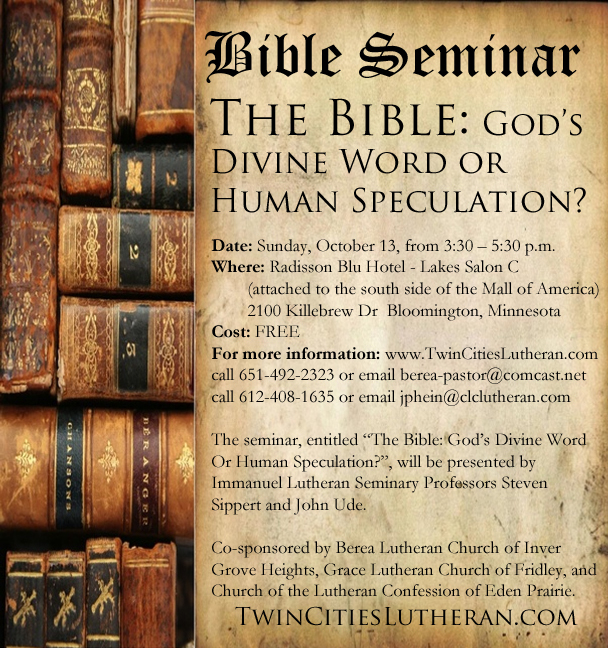 The seminar, entitled “The Bible: God’s Divine Word Or Human Speculation?”, will be presented by Immanuel Lutheran Seminary Professors Steven Sippert and John Ude. Co-sponsored by Berea Lutheran Church of Inver Grove Heights, Grace Lutheran Church of Fridley, and Church of the Lutheran Confession of Eden Prairie. This entry was posted in Events and tagged Bible Seminar, God's Divine Word.